Welcome to “The Dead Chicken Dance and Other Peace Corps Tales.” I am presently on a two month tour of the Mediterranean and other areas so I thought I would fill my blog space with one of the greatest adventures I have ever undertaken: a two-year tour as a Peace Corps Volunteer in Liberia, West Africa. Every two days I will post a new story in book format. When I have finished, I will publish the book digitally and in print. 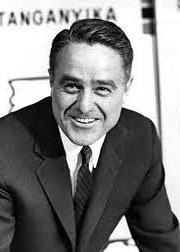 The day before Cliff sent me scurrying after the errant urinalysis, Sargent Shriver arrived on campus. I, along with several thousand other students, flocked to hear him speak. John Kennedy recruited his brother-in-law in 1961 to set up and then head the Peace Corps. “If it flops,” Kennedy had said, “it will be easier to fire a relative than a political friend.” He gave Shriver one month to create the organization. By 1965 when I joined the Peace Corps, Kennedy had been assassinated and the Peace Corps had become one of the more successful foreign relation programs in US history. He captured us. Berkeley’s Free Speech Movement (FSM) had dominated our lives. Times had been serious, even dangerous. We were ready to laugh. Three weeks after making this statement Rupley was shot to death in Caracas, Venezuela while he was working as Peace Corps staff. Shriver told us the Peace Corps was looking for unreasonable men and women. Reasonable people accept the status quo. Unreasonable people seek to change it. We were noted for being unreasonable at Berkeley. Six months earlier the UC Berkeley Administration had declared that the Bancroft-Telegraph Free Speech area was closed and that there would be no more on-campus organization of Civil Rights demonstrations in the Bay Area. The success of these demonstrations had upset powerful right-wing forces in California. Telephone lines burned between the UC Administration, Sacramento and Washington DC. Free speech and the right to support off campus political efforts were sacrificed. Student organizers reacted immediately. They said no. Some, like Mario Savio, had walked the streets of the South registering black voters and risking their lives to do so. In the summer of 1964 three of their colleagues had been killed and buried under an earthen dam near Philadelphia, Mississippi. Free Speech Movement organizers understood the value of demonstrations and media coverage. They had become masters at community organization and were focused in their vision to the degree they were willing to face police and be arrested for their beliefs. The result was a series of confrontations that ended with the massive sit-in at Sproul Hall and the arrest of 800 students in early December. While I hadn’t served as a leader of FSM or been arrested, I empathized strongly with its objectives and had participated in many of the demonstrations. I even spent several hours in the Sproul Hall sit-in. Heart pounding, I had waited in line and then stood up on the Dean’s desk in my socks and talked of rights and responsibilities. It was our right to oppose racism; it was our responsibility to do so. Out in the hall, a group of students sat on the floor… surrounding Joan Baez and singing protest songs. I sat down and joined in. “We shall overcome some day…” I was part of something, something much larger than myself. In the end, we won. Our freedom of speech, our freedom to organize, and our freedom to participate in the critical issue of the day were returned. While we were still a part of the future so popular with commencement speakers, we were also a part of the now, helping to shape that future. “You have demonstrated your leadership in the generation of the ‘6os,’ the generation that will not take ‘yes’ for an answer, which has shown an unwillingness to accept the pat answers of society… either in Berkeley, in Selma or in Caracas, Venezuela,” Shriver noted. We had not forfeited our rights at Berkeley, nor had we, according to Shriver, forfeited our claim to a fellowship with the Peace Corps. And this, at least in part, was why I had been accepted as a Volunteer. Participation in the Free Speech Movement was regarded as a plus, not a minus. But the time had come to move beyond protest. Shriver concluded his talk with a ringing call for service. The release of the hostage Police Car did not bring peace to the UC Berkeley Campus. Each time a solution seemed imminent, the Administration would renege or the FSM would increase its demands. In addition to the right to organize on campus, the disciplining leaders of the Free Speech Movement became a central issue. Demonstrations took place almost daily and were blasted in the press. I learned a great deal about media sensationalism and biased reporting. Older adults in suits taking photos looked suspiciously like plain-clothes policemen or FBI agents. It was easy to become paranoid. If we signed a petition, demonstrated, made a speech or just stood by listening, would our pictures and names end up in some mysterious Washington file that proclaimed our disloyalty to the nation? These weren’t idle thoughts. A few years earlier people’s careers had been ended and live ruined because someone had implied they were soft on communism. J. Edgar Hoover was known for tracking Civil Rights’ leaders and maintaining extensive files on every aspect of their lives. While we weren’t up against the KGB, caution was advisable. Hoover considered Berkeley a hotbed of Communism. We looked warily at those who didn’t look like us. One day a small dog was making his way around the edge of the daily demonstration, sniffing people. The wolf in sheep’s clothing was among us. It was a light moment to counter a serious time. And we were very serious. I sometimes wondered when the celebrated fun of being a college student would kick in. One day I was faced with a test more serious than any I had ever faced in the classroom. On December 2, 1964, FSM leaders called for a massive sit in at Sproul Hall, Berkeley’s administration building. Once again communication had broken down and the Administration was back peddling, caught between students and faculty on one side and increasing pressure from the outside on the other. I thought about the implications of the sit-it and decided to join. I needed to act. For three months I had listened to pros and cons and watched the press blatantly misrepresent what was happening on campus. I was angry, knowing that the public had little option but to believe that a small group of radicals was preaching anarchy. It was not wrong to utilize an edge of campus for discussing the issues of the day, or for organizations to raise funds for supporting various causes, or even to recruit students for participating in efforts to change the community. It didn’t disrupt my education. I was free to stop and listen, to join in, or pass on. What it did do was irritate powerful, established members of the community. And for that reason, our freedoms had been curtailed. Maybe if enough students joined together, the Administration would listen and the press would dig deeper. I told my fiancé I was going inside and then joined the thousand or so students who had made similar decisions. It was early in the afternoon and we were in high spirits. I believed it would be hard for the Administration to claim 1000 students were a small group of rabble-rousers bent on destroying the system. And I was right. It claimed we were a large group of rabble-rousers bent on destroying the system. Inside I was treated to a unique experience. The sit-in was well organized. Mario Savio and other FSM leaders gave us directions on what to do if the police arrived. There were clear instructions that we were not to block doorways. The normal business of the University was not to be impeded and we were not to be destructive in any way. Floors were organized for different purposes. The basement was set aside as the Free University where graduate students were teaching a variety of classes. These included normal topics such as physics and biology and more exotic subjects such as the nature of God. One floor was set aside as a study hall and was kept quiet. Another featured entertainment – including old Laurel and Hardy films, which seemed particularly appropriate. After administrators left, a desk in the dean’s office became a podium for speech making. I felt compelled to add my dimes worth. Each speaker took off his or her shoes so the top of the desk would not be damaged. The real treat though was an impromptu concert by Joan Baez. I joined a small group sitting around her in the hallway and sang protest songs. The hit of the night was “We Shall Overcome.” It provided us with a sense of identification with struggles taking place in the South. I felt like I belonged and was part of something much larger than myself. Mainly I walked around and listened, taking extensive notes on what I saw and felt. Later I would sit in the Café Med on Telegraph Avenue and write them up. They would become the basis of talks I would give back home over the Christmas break. I also turned them over to Father Baskin, an Episcopal minister who wanted to use them for a sermon at his church in Placerville. Along about midnight the un-radical part of my nature took over. I started thinking about my comfortable bed back in the apartment. The marble floors of Sproul Hall did not suggest a good night’s sleep and it appeared the police weren’t coming, at least in the immediate future. Yawning, I left the building and headed home. I would come back in the morning to chaos and an occupied campus.